A quick and easy pasta dish… the sauce has absolutely NO dairy (it’s made with avocado) but you’d never know it! Meanwhile, in a food processor, combine avocado, garlic, milk, cashews, lime juice, cilantro, hemp oil, and herbamare. Pulse until smooth. Add tomato and 2 green onions and pulse for 2-5 seconds until just combined. 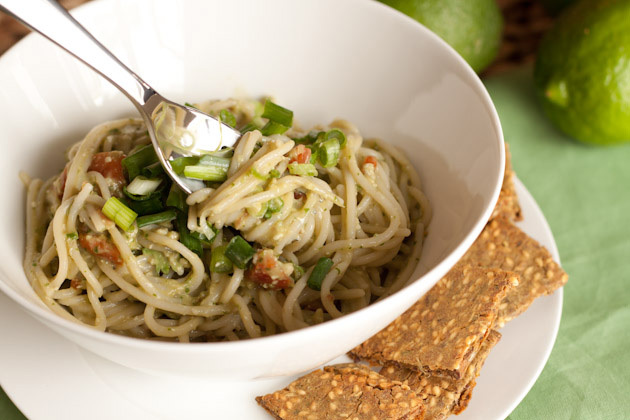 Mix guacamole sauce in with pasta and serve with green onions sprinkled over top and herb and garlic socca crackers to the side.